As you may know, the power-duo of Yosemite and iOS 8 make moving documents between your Mac and iOS devices a piece of cake thanks to AirDrop, Apple's cool and useful peer-to-peer file sharing service. But AirDrop comes with a caveat: It's not supported on older Mac OS and iOS devices. To resolve this little conundrum, I've resorted to a number of hacks and alternatives, including Dropbox, Pastebot, and, my all-time favorite, emailing myself a file or photo on devices that don't support AirDrop. 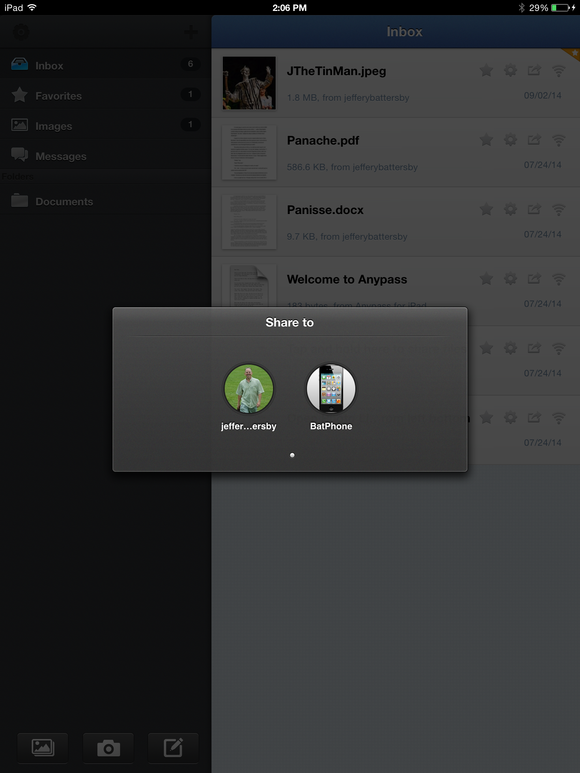 Anypass for iPhone lets you select files on your phone and easily send them to your Mac or other iOS devices. Enter Anypass, an app that works on your iPad, iPhone, and Mac, whether it supports AirDrop or not, and offers AirDrop-like features for all your devices. Anypass requires three pieces in order to work its magic: The Anypass app for iPhone or iPad, Anypass for Mac, and a Wi-Fi network. You pay $3 for each of the iOS versions, but the Mac version is free as a direct download from Icyblaze. Open the app on any device and, if you're connected to a Wi-Fi network, you'll be able to send and receive files with no further configuration required. The Mac version of Anypass is designed to launch at login, but given the way the app behaves you may want to keep it in your Dock and only launch the app when you need to use it. 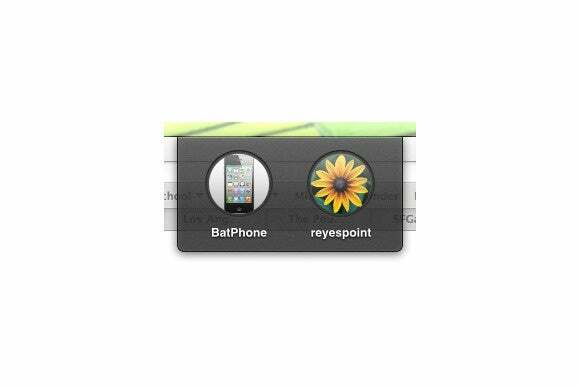 To access the app you either use a keyboard shortcut (Command-shift-D) or move your mouse to the top of the screen. When you do, a small tray drops down from the top of the screen, revealing devices available for you to send files to. Dragging a file from the Finder to one of the listed devices sends that file to the device. While the tray is a simple way to get files to your devices, I found it annoying, as it appears anytime your mouse touches the top of the screen, whether you want to use it or not. So, opening a menu? Accidentally move your cursor to the top of the screen? Hello Anypass tray. A better, less obtrusive option might be to offer a preference that lets the app run in the Dock so you can drag files there when you want to send them to another device. There was one other significantly more irritating issue with the Mac app. All too often it required a quit and restart in order to locate the devices on the network available for sending files. A support request sent to Icyblaze didn't result in a fix—instead, the support tech also recommended that I quit and restart the app. 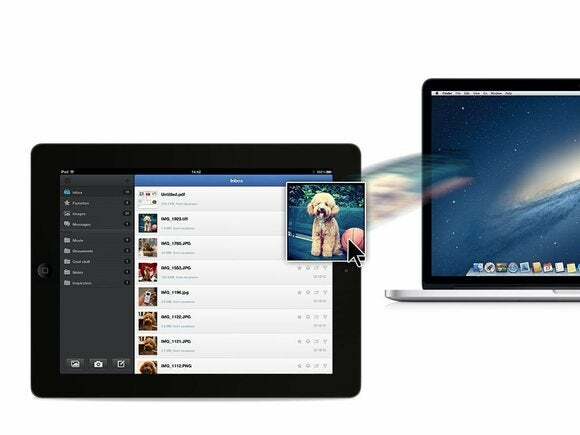 On your Mac, send files to other devices by dragging and dropping them in a tray appearing at the top of your screen. 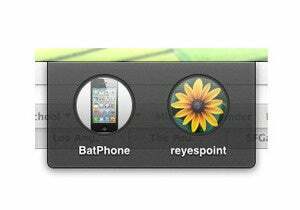 While bugs and the occasional typo plagued the Mac app, the iOS apps offer no such annoyances. Both worked without issue and made quick work of transferring files between devices. The iOS apps offer options for organizing files within the app and for sending photos from your camera or photo library to other devices. Due to limitations in iOS, there is no way to select and send files created with other apps while you're in Anypass. But the app does include a built-in text editor you can use to send text files to other Anypass users and every app that offers the “Open in Another App” feature can add files to Anypass, after which you can use Anypass to send those files to other devices. Anypass for iOS offers a simple security feature to prevent unauthorized access to files you have stored in the app: you can create a passcode requirement for opening the app. But, while this will keep anyone from opening and viewing documents stored in Anypass, once the app is open and displaying the passcode screen it is possible to send files to Anypass without entering the passcode. While the Mac version of Anypass is a little buggy, that bugginess doesn't limit its value. Anypass is an excellent solution for sharing files between your non-AirDrop capable devices, making it the simplest way to transfer files between devices with zero configuration required. 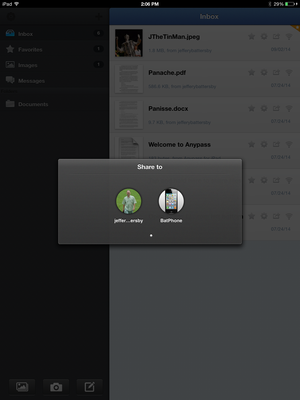 Anypass is an excellent solution for sharing files between your non-AirDrop capable devices, making it the simplest way to transfer files between devices with zero configuration required.